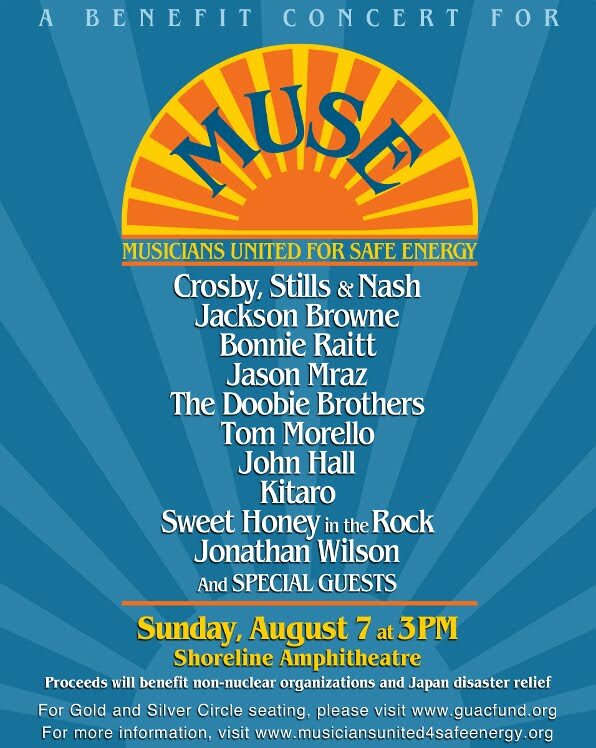 Today, Sunday August 7, an all-star line-up will perform a benefit concert for Musicians United for Safe Energy (MUSE) at Shoreline Amphitheatre in Mountain View, CA; showtime is 3PM. The event supports disaster relief efforts in Japan and organizations worldwide working to promote clean, safe energy and appropriate technologies toward a non-nuclear future. The line-up includes Crosby, Stills & Nash, Jackson Browne, Bonnie Raitt, Jason Mraz, The Doobie Brothers, Tom Morello, John Hall, Kitaro, Jonathan Wilson, Sweet Honey in the Rock, plus special guests. 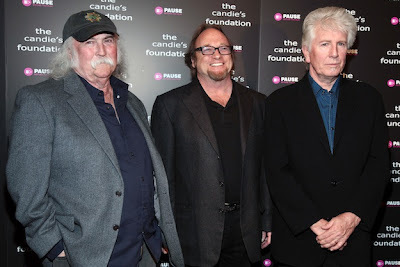 The artists will perform together throughout the show, with Browne and Raitt anchoring the first set, and Crosby, Stills & Nash closing the show. To bolster fundraising, MUSE will have live streaming and global online donations, and MobileCause for text2give donations and concert updates in the U.S. (both platforms are live now). Streaming of the MUSE event will begin at 2PM (PST) on August 7; viewers will get exclusive pre-show content and the main feed of the concert. To pre-register for a minimum $5 donation, log on to http://bit.ly/musebenefit. Mobile giving for MUSE is via MobileCause through its text2give service (U.S. only). People may donate by texting MUSE to 80888. A one-time $10 donation will be added to the user's mobile phone bill; complete terms can be found at www.igfn.org/t. Additionally, MUSE concert updates can be accessed by texting CONCERTNEWS to 27138. Proceeds from the concert will be distributed to Musicians United for Safe Energy (MUSE) to support Japan disaster relief efforts, and organizations worldwide working to promote safe, alternative, non-nuclear energy. It was shortly after the March 2011 earthquake and tsunami that triggered multiple meltdowns at the Fukushima Daiichi nuclear plant in Japan that the decision was made to coordinate a benefit. 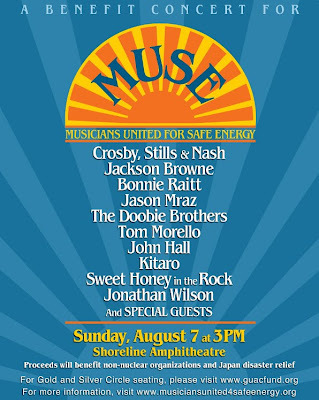 Shoreline Amphitheatre was chosen because of its close proximity to the Pacific Rim, Northern California’s history and deep association with Japan—and because nuclear reactors on the California coast store spent fuel rods in the same manner as at Fukushima. The concert date falls between the anniversaries of atomic bombs dropped on Hiroshima (August 6, 1945) and Nagasaki (August 9, 1945). Pat Simmons, of The Doobie Brothers, who performed at the original MUSE shows adds, "We are so proud to be reuniting with so many of our talented friends, who share our concern for the safety, and sustainable future of our fragile planet. Current events have brought us to a turning point in our human existence. It's time to consider alternatives to the present course of energy production that have been forced upon us by an aggressive corporate power structure. We join together to generate funds to help our Japanese friends, as they recover from the devastation that they have had to endure, due to man's careless use of nuclear energy, and nature's unpredictability. Through these efforts we also hope to raise public awareness of the challenges we are faced with, and the important responsibilities we share in moving us towards a safer, nuclear free future." The concert stage will be powered by an integrated system of clean, alternative energy sources, using solar, biodiesel, and wind technologies. The energy-saving GRNLite LED lighting rig for the show has been donated by Bandit Lites, and Schubert Systems has donated the sound rig. In addition, Shoreline is the largest Green certified concert venue in the United States and is a founding member of the Green Music Group. One goal is that the concert will inspire musicians in other areas to organize shows that both employ and promote safe energy alternatives, and that raise funds for disaster relief efforts and for groups—local, regional, national, and international alike—advocating non-nuclear programs and initiatives. "Even though the news cycle has moved on from the Fukushima disaster, this is another massive world energy disaster from which there will be long-term effects,” adds Jason Mraz. “I am thrilled to be a part of this amazing show that will not only help those in Japan, but that will also call attention to the urgent need to embrace safe, clean energy alternatives." I remember going to the No Nukes show at The Orpheum with my sister. It was the summer of 1978 and many of today's performers were also on the bill, including Jackson Browne, Bonnie Raitt and John Hall. Pete Seeger was the headliner, and I remember him leading the crowd in a sing along of The Lion Sleeps Tonight, then he and Jackson Browne did a wonderful version of This Land Is Your Land. Nice memories! So hope it's another great show and everyone has a good time. Thanks for the memories Mr H.! Hopefully we'll get some lasting memories from today's concert. And maybe some commitment for clean, safe energy.